I’ve been making mayonnaise for a while now. I’ve used it for buttermilk ranch dressing, macroni salad, horseradish sauce, onion ring sauce, thousand island dressing and deviled eggs. A couple of times I said that it didn’t come out as thick as I would have wanted, but that was okay since it was an ingredient in a sauce. Well, after enough trial and error I think I can finally explain how to do it consistently. 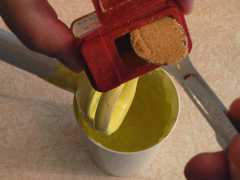 The key to making mayonnaise is to get a good emulsion going. That means droplets of the yolks are suspended in the oil. Do it wrong and you get greasy, oily yolk. Do it right and you get thick, rich mayonnaise. First step is to separate the yolks. Put them in the narrowest vessel your immersion blender fits in. I’m lucky that mine came with a cup made to fit it. Add two tablespoons of vinegar. Here’s where the trial and error starts to pay off. When I first went looking for directions I found a video where a guy added the oil right after the vinegar. 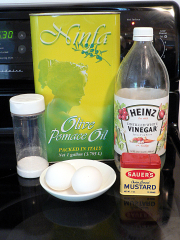 The idea was to add the oil gently so the vinegar and yolks stay together. 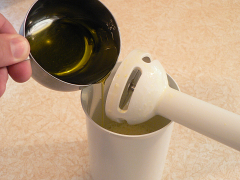 They have to form the emulsion before the oil starts getting incorporated. Don’t try that. It potentially saves you maybe 30 seconds, and makes it really easy to screw up. 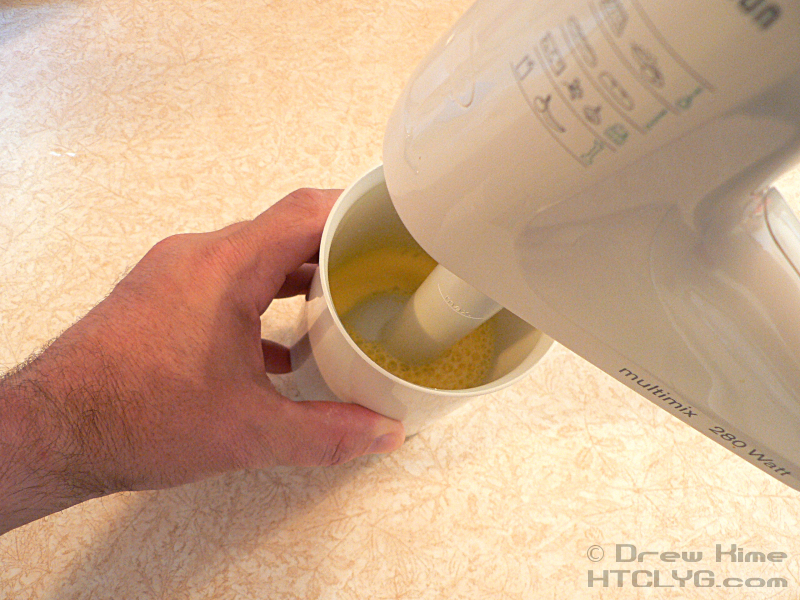 Just hit the vinegar and yolks with the blender for 15-20 seconds and you’ll have a good emulsion going. 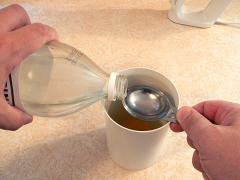 Then add about a quarter-cup of the oil and blend again. If you’ve got a good emulsion it should look sort of like instant pudding at this point. Thicker than cream, but not completely mayo-thick yet. You’ll notice my mayo has a slightly odd color. That’s not bad color in the photo, it’s because I’m using the olive oil which is pretty green. 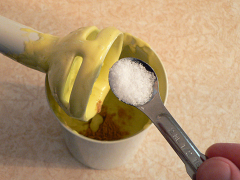 Add the mustard and salt and another quarter-cup of the oil. Each time you add oil and blend again it should get thicker. 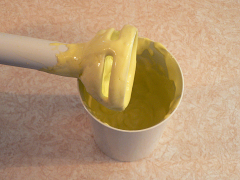 If it suddenly gets thinner, you just “broke” the emulsion. 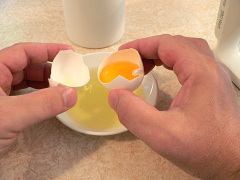 Don’t worry, just pour out what you’ve got so far into a separate cup, and start over with another yolk and tablespoon of vinegar. Once you get the emulsion going again, start adding the first batch back in a little at a time. Blend yolks and vinegar until an emulsion forms. This means they are thoroughly combined and don't separate when you stop blending. An immersion blender works best. It's possible to do this by hand with a whisk, but it's so difficult it's been used as a challenge on TV cooking shows. Drizzle the oil in slowly while blending. Some people recommend one drop at a time. These people are sadists. Add the mustard powder and salt after half the oil is in. If the emulsion "breaks", meaning it starts to separate, start again in a clean bowl with another egg yolk and tablespoon of vinegar. Then slowly drizzle in the broken emulsion the same way you did with the olive oil.